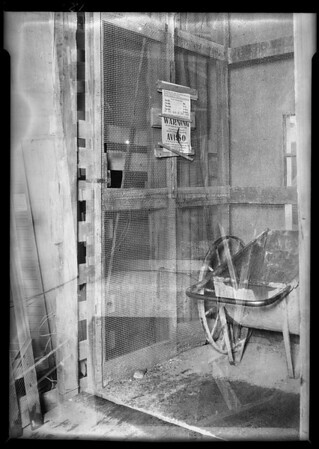 Photograph of elevator shaft construction, Edison Co. building, Southern California, 1931. "All employees must observe the folowing rules in the operation of this material elevator. DO NOT STAND ON CAGE WHILE SIGNALING, Use the Follwoing Signals: One Bell, Stop, Two Bells, Go Up, Three Bells, Go Down, Four Bells, Go Slowly, Do Not ride in this cage, anyone found doing so will be immediately discharged. Warning, DO NOT RIDE ON THIS ELEVATOR, Any employee disobeying this rule will be discharged immediately, aviso, NO SE SUBA EN ESTE ELEVADOR. Cualquier empleado que desobedece esta ordern sera desocuapdo immidiamente, Walker company"-- on sign.